Innovation is about finding a better way of doing something. Like many of the new development buzzwords (which many of them are over-used on many business documents), the concept of innovation originates from the world of business. It refers to the generation of new products through the process of creative entrepreneurship, putting it into production, and diffusing it more widely through increased sales. Innovation can be viewed as t he application of better solutions that meet new requirements, in-articulated needs, or existing market needs. This is accomplished through more effective products, processes, services, technologies, or ideas that are readily available to markets, governments and society. The term innovation can be defined as something original and, as a consequence, new, that “breaks into” the market or society. The taxonomy is illustrated with the following diagram. The differences are also evident in the mechanisms that exist to protect the works: Novelties are usually not protectable, Creations are protected by copyright or trademark, Inventions can be protected for a limited time through patents (or kept secret) and Innovations can be protected through market competition but are not defensible through legal means. Innovation is a lot of talked about nowdays as essential to businesses to do. Is innovation essential for development work? article tells that innovation has become central to the way development organisations go about their work. In November 2011, Bill Gates told the G20 that innovation was the key to development. Donors increasingly stress innovation as a key condition for funding, and many civil society organisations emphasise that innovation is central to the work they do. Not all development problems require new solutions, sometimes you just need to use old things in a slightly new way. Development innovations may involve devising technology (such as a nanotech water treatment kit), creating a new approach (such as microfinance), finding a better way of delivering public services (such as one-stop egovernment service centres), identifying ways of working with communities (such as participation), or generating a management technique (such as organisation learning). Theorists of innovation identify innovation itself as a brief moment of creativity, to be followed by the main routine work of producing and selling the innovation. When it comes to development, things are more complicated. Innovation needs to be viewed as tool, not master. 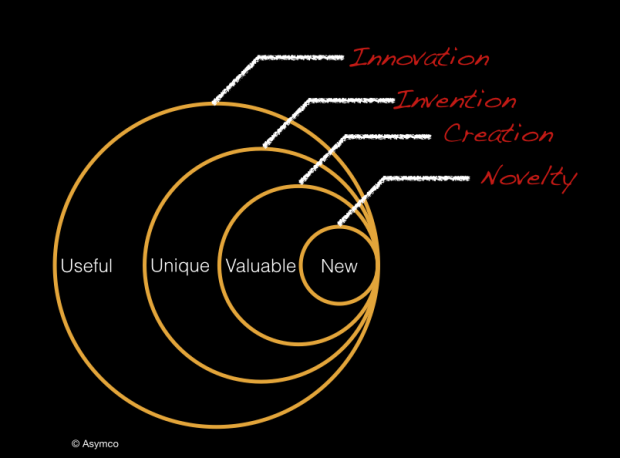 Innovation is a process, not a one time event. Genuine innovation is valuable but rare. 8 essential practices of successful innovation from The Innovator’s Way shows essential practices in innovation process. Those practices are all integrated into a non-sequential, coherent whole and style in the person of the innovator. System integration is a critical element in project design article has an interesting project cost influence graphic. The recommendation is to involve a system integrator early in project design to help ensure high-quality projects that satisfy project requirements. Of course this article tries to market system integration services, but has also valid points to consider. Core Contributor Loop (CTTDC) from Art Journal blog posting Blog Is The New Black tries to link inventing an idea to theory of entrepreneurship. It is essential to tune the engine by making improvements in product, marketing, code, design and operations. There are key strengths in an engineering firm. How those strengths measure against other firms and what makes your firm unique in the marketplace require two things: a good understanding of your market and the ability to self-reflect. Many owners and leaders use metrics and indicators to look at a firm’s health. It’s important to use “lagging” indicators—such as profit and loss and balance sheet data. These indicators inform management about the firm’s history. Equally important are leading indicators that can provide clarity to future performance. Think about what metrics are being reviewed to identify future improvements, test your position against external factors, and act as those leading indicators. With the right indicators, changes in the market can be detected early. When analysis shows the need for change, preplanned responses can allow for rapid change. Preplanning may sound militaristic; however, the concepts around what to do for engineering firms can prevent crises in the organization and capitalize on situations that would ordinarily leave a firm on the back foot. Perfect prior planning and preparation will prevent poor performance. Many within engineering firms are all for change as long as they aren’t the ones who have to change. What do self-driving cars, advanced 3D printers, and the next generation of “smart” prosthetic limbs have in common? They are all beneficiaries of the emergence of embedded motion-control technologies (see also “Three Trends Driving Embedded Motion Control”). These systems, which pair application-specific motion-control silicon with open hardware and software platforms, are part of the Fourth Industrial Revolution, a trend that is accelerating the rate of innovation for robotics, industrial automation, and even consumer products that use mechatronic technology. This new class of devices simplifies the development of mechatronic products by “encapsulating” most basic control functions as hardware logic or verified software building blocks that embedded developers can work with using the same rich toolsets and code libraries that they use for conventional applications. In addition to dramatically shortening development cycles, embedded motion controllers make it possible to add new capabilities to existing products while also facilitating the emergence of many new classes of products. Embedded motion control technology’s lower cost, compact form factor, and versatility is reducing the cost of control automation and other traditional industrial applications. These advantages have also made it possible for embedded motion control technology to address new application spaces in the commercial and industrial sectors, where developers face new demands and requirements such as battery operation, IoT capability, and shorter development cycles. At the Huaqiangbei Market in Shenzhen, you can build a smartphone from scratch in a couple of hours. How much choice should you have? Security, like ease of use, is a prerequisite to fully engaging on the potential of a connected world. Today, with all of the distance we’ve come, social engineering – a human contacting a human – is still the biggest class of security exploit. We will always need improvements in technology security, but it will never be enough without solving the human social problem. It sounds like science fiction: a device that can reconnect a paralyzed person’s brain to his or her body. But that’s exactly what the experimental NeuroLife system does. Developed by Battelle and Ohio State University, NeuroLife uses a brain implant, an algorithm and an electrode sleeve to give paralysis patients back control of their limbs. For Ian Burkhart, NeuroLife’s first test subject, the implications could be life-changing. Team scientists believe the shortcomings of robots offer the perfect opportunity for humans to become better, more efficient collaborators. Today, the country’s best colleges are an overpriced gated community whose benefits accrue mostly to the wealthy. At 38 colleges, including Yale, Princeton, Brown and Penn, there are more students from the top 1 percent than the bottom 60 percent. Tuition prices aren’t the only reason for this, but they’re a major one. Public university tuition has doubled in the last two decades, tripled in the last three. Most of the time, the maths in our everyday lives works quietly behind the scenes, until someone forgets to carry a ’1′ and a bridge collapses or a plane drops out of the sky. Humanity will abandon speech and communicate using nothing but thoughts by 2050. We certainly don’t need to run our schools like businesses—but we could benefit from educational organizations more focused on continuous improvement. Virtual reality for pain relief and Stentrode: A brain computer interface that can be implanted in the brain without open brain surgery. The fact is we know that PowerPoint kills. Most often the only victims are our audience’s inspiration and interest. This, however, is the story of a PowerPoint slide that actually helped kill seven people.